The idea that technology will fix complex and systemic problems like climate change, poverty, the housing crisis, or health care is simplistic to say the least. We need a radical shift in how we live, and designing for environmental and social sustainability cannot simply be about applying new technologies to our existing models of living. We need to support models of living that can both improve our actual well-being and reduce material demand on the planet. This is just the beginning of the relationship, as all eyes are on the future development of the 750 acres neighboring the site along the eastern waterfront. It has been a year of scandals at Silicon Valley, from Google sharing emails with app developers to a joint investigation between the Justice Department, the FBI, the Federal Trade Commission and the Securities and Exchange Commission into data leaks by Facebook. A networked neighborhood built “from the internet up,” may not be the selling feature Sidewalk Labs had hoped it would be. It should come as no surprise that many people are suspicious of this proposal. These critiques, by academics, technology writers, and concerned citizens are warranted because so far, “smart city” approaches the world over have generally been related to top-down processes with a focus on new technologies. People who live in these cities are often excluded from meaningful participation in the planning process that later impacts their lives. Given the levels of engagement on this issue, it’s quite clear that the citizens of Toronto are hungry for the opportunity to truly participate in making their city better. Some think it’s some kind of approach to affordable housing, which has yet to be the case in North America. There is little understanding of how the nature of this kind of intentional community represents a fairly radical, and positive, shift in modern living, where people learn through regular practice to build consensus with their neighbors on issues of sharing, co-caring, and meaningful collaboration. This is a model of design, development, and management that when done properly, can contribute to a “bottom-up” approach to building the city. Yet in both the proposal itself and media coverage, cohousing isn’t clearly defined. Cohousing includes participation in the project’s design, development, and management by a self-organizing group or collective. It is one of a number of collective housing models that emerged in northern Europe in the late 1960s and 1970s. Decisions are made by consensus and talking through differences is central to the creation of these communities. Residents own or rent complete private dwellings within the larger project (typically between 15 to 33 households), while also sharing common property, such as a common house, a large kitchen and dining area, guest suites, and gardens. One reason that this model is interesting is that it shows us that when members of an intentional community get together to design their own neighborhood, they opt for less personal space and more shared resources; they opt for materially simple, yet rich relational lives. 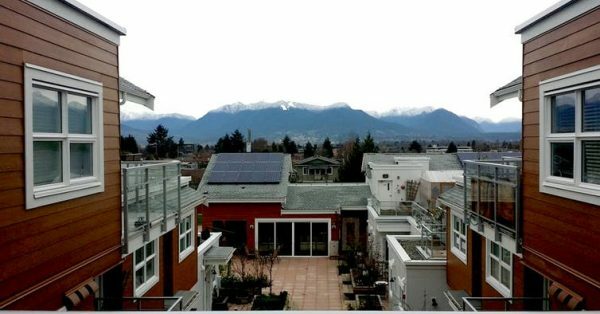 Cohousing communities across Canada and the United States could benefit from the capacity of companies like Sidewalk Labs to mobilize people, politician, and resources. The sense of community that emerges from cohousing developments is not merely due to its physical design, nor is it a happy accident—it is the central aim of the development and management process, which starts prior to the design and development of these communities. Cheryl Gladu is a doctoral candidate at Concordia University in Canada. This article was first published on The Conversation.